By Francisco J. Sánchez, Under Secretary of Commerce for International Trade. I’ve arrived in New Delhi, India, with a Clean Technologies trade mission of seven U.S. companies eager to find partners in key sectors such as renewable energy, energy efficiency, and environmental technologies. After New Delhi, we will travel to Hyderabad, a high-technology hub in the south; and then the companies will go on to Ahmedabad – an important “next tier” city in the western Indian state of Gujarat. As one of the fastest growing economies in the world, India offers enormous potential to U.S companies. It has critical infrastructure needs in energy, transportation, environment, and supply chain, to name a few – all areas where U.S. companies can offer cutting-edge technologies. I strongly believe that India’s needs are our companies’ potential opportunities. This is my first trade mission to India, but my third visit as Under Secretary. A year ago, I came here with President Obama, and two months before that, I came to launch our GEMS initiative – Growth in Emerging Metropolitan Sectors. Why the attention to India? The Administration accords great importance to our relationship with India. President Obama said in November 2010 before the Indian Parliament that the U.S.-India relationship “will be one of the defining partnerships of the 21st century.” This trade mission advances President Obama’s National Export Initiative, which aims to double U.S. exports by the end of 2014, supporting economic and job growth. This should be an achievable goal with India – we already doubled exports between 2005 and 2010! I am continually impressed by the vibrancy and entrepreneurial spirit of India’s private sector. In many ways our two business communities are ahead of the governments in expanding the relationship. 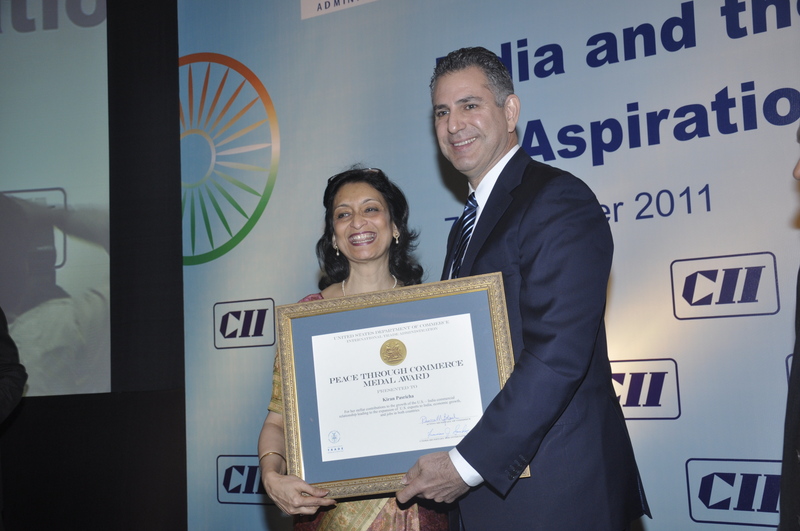 That’s why I’m especially pleased that I was able to give a Peace through Commerce Award yesterday to a key private sector partner – and friend – Ms. Kiran Pasricha, former head of the Washington office of the Confederation of Indian Industry (CII). The Peace through Commerce award was actually started by President Thomas Jefferson, but it had fallen into disuse. I brought it back because I wanted to recognize our partners abroad. Kiran has been a wonderful partner who has had the foresight to understand how trade can contribute to the broader relationship, and help bring prosperity to both our nations. Today (Tuesday) India’s Commerce Secretary Rahul Khullar and I co-chaired a public-private session of the U.S.-India Commercial Dialogue. Through this Dialogue, the two governments and the two private sectors regularly work together to find solutions to nuts-and-bolts commercial issues. In today’s session, we talked about what conditions are necessary to build a modern, flourishing cold chain. A cold chain is the system for transportation of perishable products such as food, chemicals, and drugs along a supply chain, together with the logistical planning to ensure the integrity of such shipments. I very much appreciated the participation on the U.S. side of the Global Cold Chain Alliance, the American Chamber of Commerce, and the U.S.-India Business Council; and on the Indian side, of CII. Secretary Khullar and I will be working with our business communities to set an agenda on a range of different topics for the coming year. In 20 years, 68 cities in India are expected to have populations surpassing 1 million. And total annual income of households in urban areas is expected to reach $4 trillion in 2030. This is a huge market for both Indian and American companies. This is why India was the place where we started the GEMS initiative. I want to make sure we continue that effort. So yesterday I met with a number of officials from some of the states surrounding New Delhi. After our stop in Hyderabad, where I will inaugurate SOLARCON, a preeminent trade fair for solar technology, the companies will go on to Ahmedabad. At the same time, India poses a number of serious market access barriers for our companies. In my talks with government officials this week, I have urged them to continue to become more open to the investments and the innovations of foreign companies. In this way, India will improve its chances of meeting the needs of its people – and together we can prove that trade and investment will be win-win for us both.